Only 10 minutes by car from the heart of Aizuwakamatsu City (population of over 120,000) lies Higashiyama Onsen: a convenient location with unique history and luxurious, natural hot springs that are unparalleled. It is said that the onsen village was loved by many artists and poets, Such as Yumeji Takehisa and Akiko Yosano. Higashiyama’s onsen are ryusan-ensen or sodium-sulphate hot springs. Slowly unwind your mind and body as you relax in the warm waters. Tsurugajo has a history of about 630 years. The original castle was built by Ashina Naomori, and named Higashi Kurokawa-kan. The castle became famous because it was able to resist fierce invasion for 1 month during the Boshin war. Though the castle was demolished in 1874, it was rebuilt in 1965, and in 2001 it was restored using local and traditional castle building methods of the Edo period. 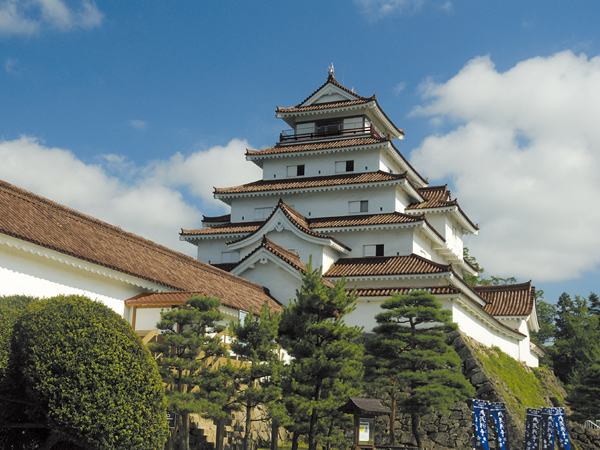 The inside of the castle tower has become a local museum where visitors can learn about the history of Aizu. In 2011, the roof tiles of the castle tower were replaced with red tiles, in order to more accurately reproduce the castle during the Edo period. The castle is the only one in Japan which features red tiles. Access 10 minutes by car; 5 minutes on foot from the Haikara-san/ Akabe “Tsuruga-jo Iriguchi” bus stop. 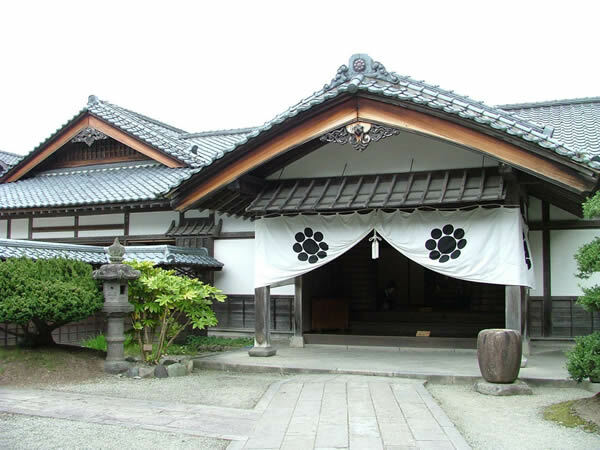 The Aizu Bukeyashiki was the home of the Aizu Clan chief retainer, Tanomo Saigo, during the Edo period. An important cultural property of Fukushima, the Nakahata Jinya, stands in the center of the mansion, as does a sukiya-style tea house. Historic structures such as rice mills can be found just outside of the mansion, in the outdoor Museum Park. The building has been reconstructed to fully represent the mansion as it stood during the middle of the Edo period, including realistic dolls throughout the 38 rooms to illustrate how each room was used at that time. On site, there are also a variety of attractions including an Aizu history museum, an art museum featuring the Buddhist paintings of Aizu, a statue of a guardian dragon. A variety of Aizu and Fukushima goods are available at the “Sato Kobo Kokon” shop, and regional Aizu cuisine is served at the restaurant, Kuyoutei. You can also enjoy painting Akabeko, Okiagari Koboshi, and more. Visitors can also enjoy learning about the Aizu Bukeyashiki, the home of Tanomo Saigo, and the history of Aizu with fun Explorer Quiz Cards (1 card is 300 yen (3 types). If you answer all over the questions correctly, you will receive a souvenir. A national historical site. Located in a vast forest near Higashiyama Onsen, is a vast Shinto gravesite. The cemetery has a solemn air, and is unlike any other cemetery for feudal lords from the Edo period. It is the location of the tombs of the Aizu lords, from the 2nd to 9th and final lord, Katamori. The first lord of the Aizu clan, Masayuki Hosina, opened this Innai-yama (Mt.Innai) site as a grave yard in 1657 upon the death of his son Masayori. 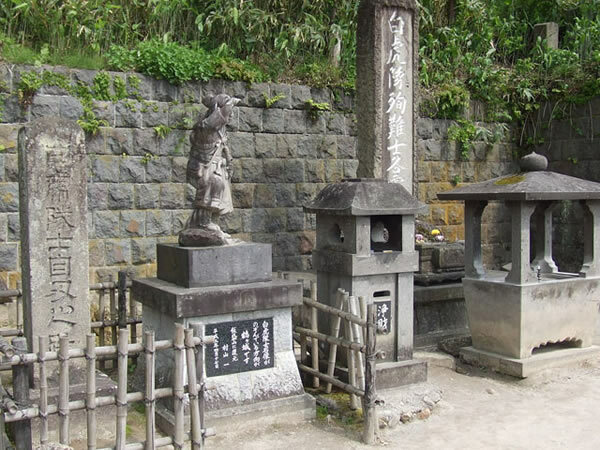 On the right side, amongst the graves of the children and spouses of the lords, lies the grave of Masayori. Descending down the left side of the mountain are the graves of the 2nd lord, Masatune (with a Buddhist style grave), as well as the graves of the 3rd lord Masakata down to ninth and final lord, Katamori (who are all buried in the Shinto style). 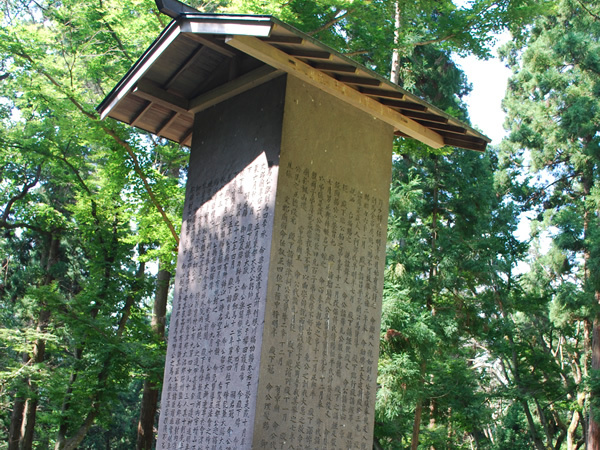 It should be noted the original grave of Hoshina Masayuki was located in Inawashiro-machi, Mineyama. During the Boshin War, the 20 boys, aged 16 to 17, of the second brigade of the Byakkotai retreated from the battle at the mouth of Tonokuchiseki via the secret Takizawa pass. When they reached the exit of the path on top of Iimoriyama, the boys saw that the castle tower of Tsurugajo was enveloped in black smoke. With determination, the boys cried “as the castle falls, so shall we too for our lord”. Only 1 of the 20 members, Sadakichi Iinuma, survived. It is thanks to him the loyalty and fate of the Byakkotai is widely known. The origins of the name “Iimoriyama” comes from the mountains shape, which resembles a serving or rice. During the Boshin War, the young men of the Aizu clan Byakkotai 2nd Brigade fought bravely at the battle at the mouth of Tonokuchihara, but were forced to retreat. From their vantage point, the boys saw the fires of the residences down below, but mistook the scene as the fall of the castle itself. Distraught at the thought they no longer had a home to return to, the boys took their lives with their own swords. It is said that nearly 2 million people visit the 19 graves of the Byakkotai each year, to lite incenses and pray for the boys who died in their youth. This site which is connected to the Byakkotai is also dotted with historical sites, including the nationally designated historical property, the Sazaedo. When the sons of the top Aizu clan samurai turned 10, they entered the Nisshinkan. Until the day they turned 15, they were educated in recitation, etiquette, martial arts, and more. Graduates of the Nisshinkan who excelled went on to high levels of learning, including schools in Edo or in other clan schools. 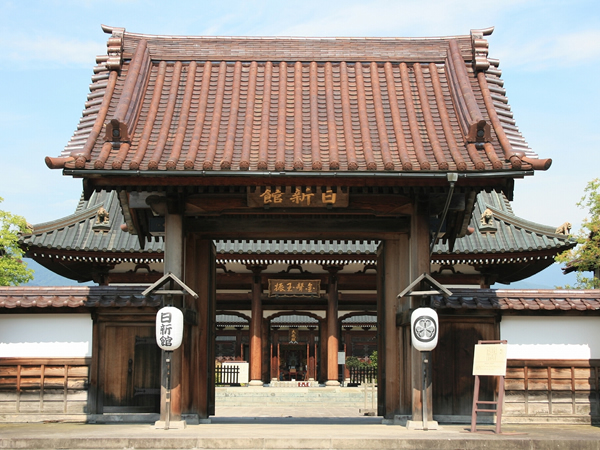 It is said that the Nisshinkan was one of the best educations of its kind in Japan. At the restored Hanko Nisshinkan, you can experience firsthand the education of the young boys from that time period. The school was burned down in 1868, during the Boshin Civil War. Only the observatory of the western side of Aizuwakamatsu castle was left. 20 minutes by Car, 5 minutes from the Ban'etsu Express way Bandai-Kawahigashi IC exit. 5 minutes from the Aizu-Wakamatsu IC exit. Take the Tohoku-Shinkansen, bound for Koriyama. Take the JR Ban'etsu West Line, and get off at Aizu-Wakamatsu Station. From the station, it is 15 minutes by taxi, or 30 minutes by bus. CopyRights (C) 2014　Higashiyama Onsen Tourism Association　All Rights Reserved.